← My very stylish pants. It is strawberry season here in southeastern Pennsylvania right now – the juicy red berries are available at farmers’ markets and local farm stands, begging for attention with their vibrant green caps and happy demeanors. Although the season is short for these local fruits, it just happens to be strawberry season all year ‘round at my house. Several years ago (I think in February, 1999 – yes, I’d say that was several years ago! 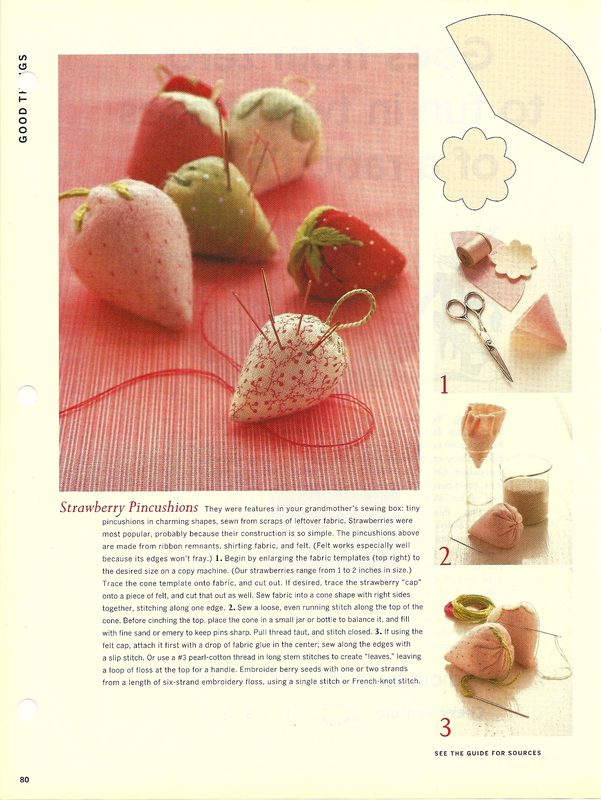 ), there was a crafts feature on “strawberry pincushions” in Martha Stewart Living magazine. I was immediately smitten with these tiny treasures. 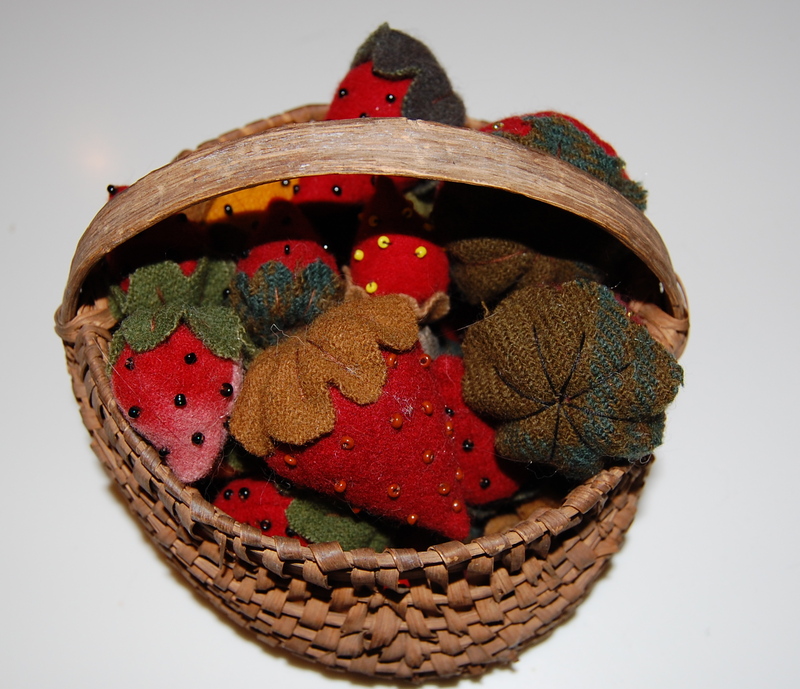 However, instead of pincushions, I envisioned them strictly as little woolen fruits to put in baskets and on display in various corners of my house. A plump woolen berry, inspired by the feature in Martha Stewart Living Magazine. I made three variants of the pattern, small, medium and large, with corresponding sizes of “caps” . After a few trials and errors, I had a routine in place to make these little whimsies. 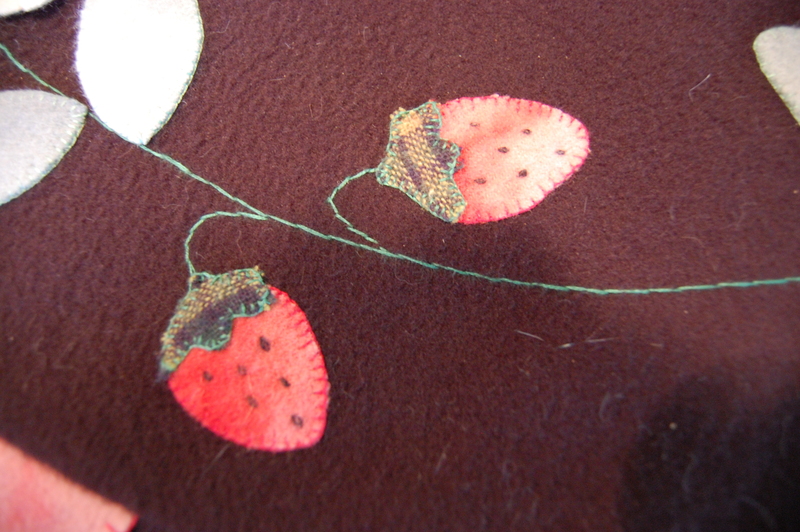 First I cut out quite a few of the “curved triangle berry pieces.” Next I sew the side seams all on the machine. Then, working on one at at time, I hand sew a running stitch around the open top. Next comes the stuffing, which is simple fiberfill, although they could be stuffed with wool roving or even cotton balls! Once they are nicely stuffed, I pull the thread to close them up, secure with a knot, but leave the thread and needle attached. Next comes the beading, which is totally at random, and so much fun to do! Just poke through the fiberfill with the needle out onto the surface of the berry – one loop through a bead is all you need. Go from one bead to another, rethreading as needed. For the first few I made, I followed the magazine directions for “French knot” seeds, but I’ve never been able to make French knots that I am happy with. I really like the little bit of glimmer that the beads add to the berries – kind of like the real thing! Then after the beading, I stitch the tops on, making “veins” with thread. Before you know it, you’ve got a plump strawberry which will last forever! Here is a gathering of some of my woolen berries, showing the various colors of wools I used. I couldn’t resist making some yellow berries. 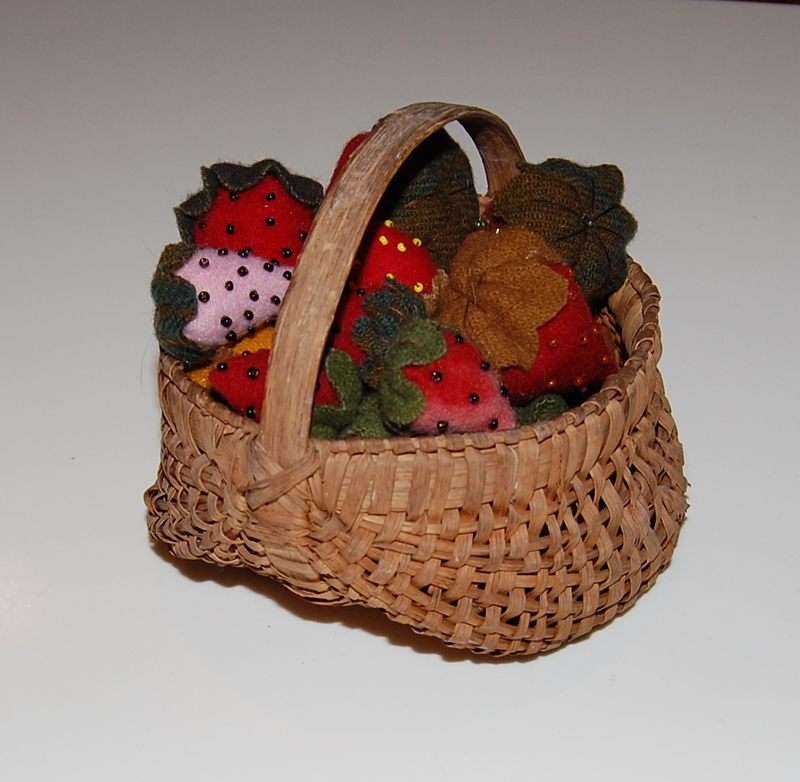 A small basket brimming with woolen berries. And a top-down view of the same basket. You can see the “veining” in the berry cap on the far right. By now I have made so many of these woolen berries that I gave up counting a long time ago. I have given bunches of them as gifts, I’ve even sold a few, and I still make batches of them on and off throughout the year. 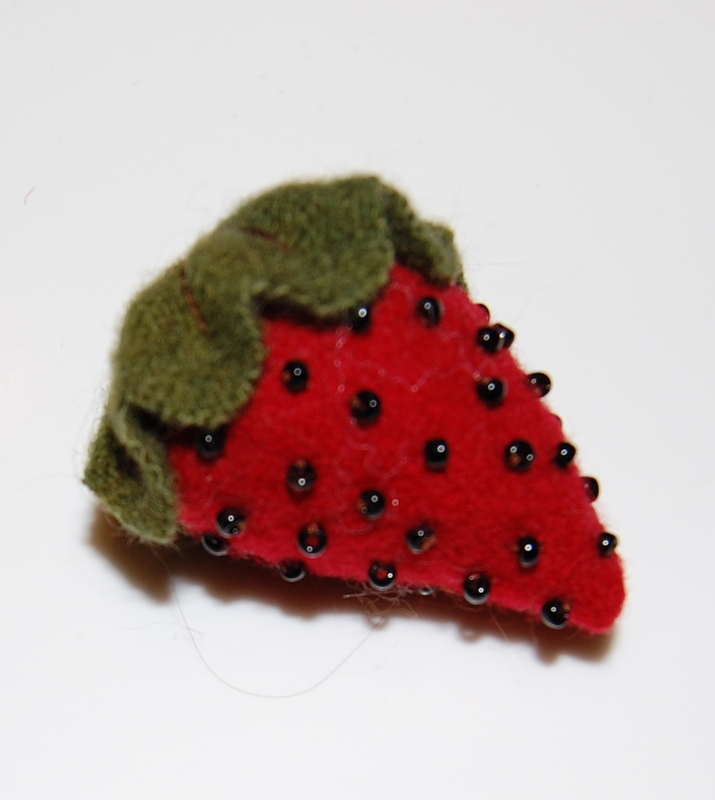 I save any little scrap of red, pink, green, tan and yellow wool to use for these berries. 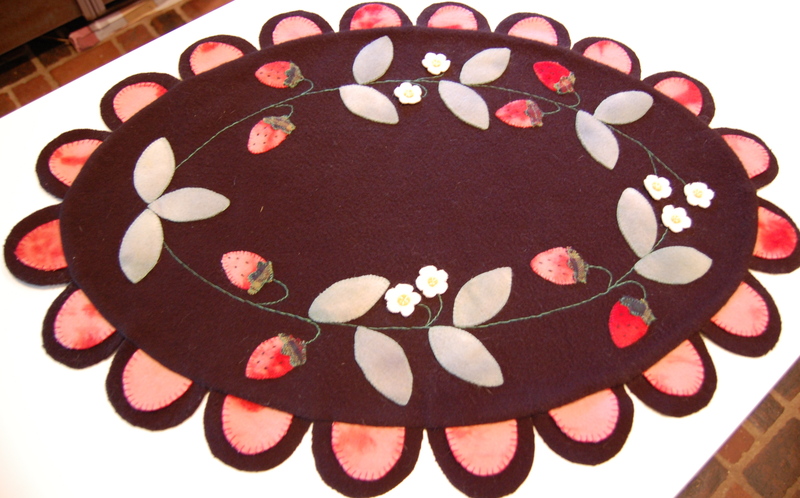 Then, for a change of pace, a few years ago I made a strawberry penny rug from a kit. Unlike my woolen berries which hang out all year round on display here and there in my house, I usually only use this table-top penny rug during the summer season. Here is a detail of the penny rug. The pattern called for French knot seeds, but I used simple short stitches instead. While I love decorating with my berries, the strawberry motif doesn’t translate very well into classic wearable fashion – or does it? Here is some ribbon I have had stashed away since the early 1980s. Red and green berries on navy blue. Here is a detail of the motif on the ribbon. With just about 2¼ yards of length, I am thinking about making a semi-tailored hatband and bow from it. Backed by a wide red grosgrain ribbon, I think it could be quite effective on the right wide-brimmed straw hat. 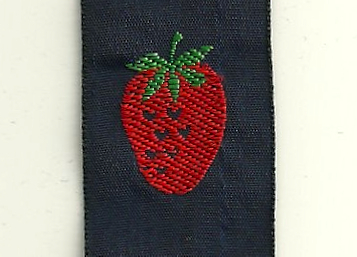 The red grosgrain ribbon sets off the strawberry ribbon quite well! Finally, I can’t end this post without sharing this pattern from the early 1970s, which I have admired for decades. From the Vogue Designer series, circa 1972. When I had the chance finally to buy it in my size from Sew Vintage Ladies, an Etsy shop, I pounced! While I usually do not feel any great attachment to the fabric and color combinations featured on any particular pattern, this one is an exception to the rule. It must be the stunning combination of red and green (a la strawberries??) which draws me to this dress, and makes me want to make one in just the same color scheme. The only notable change I would make is to the collar, whose long points I would tame a bit. Dare I dream to be wearing this dress by the time next strawberry season rolls around? I think if you can wear cherries then if you find the right retro strawberry printed fabric you can wear it with no problem. (It just seems to be hard to find a good print that isn’t really juvenile looking.) 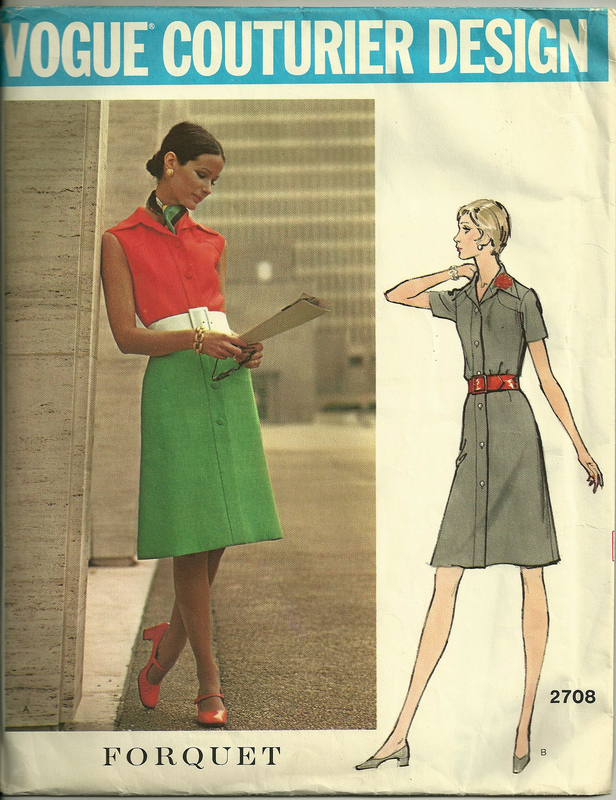 I really like the bright red and green dress combo – very cheerful! The trick with strawberries is not to look cutesy – or juvenile, as you mention. But I can certainly envision that ribbon on a hat and looking classy, not cutesy. It’s on my project list…. Cute strawbs and fantastic pattern. I’m not surprised you have been ‘stalking’ etsy for this one. Do show us when you make it up. Please? 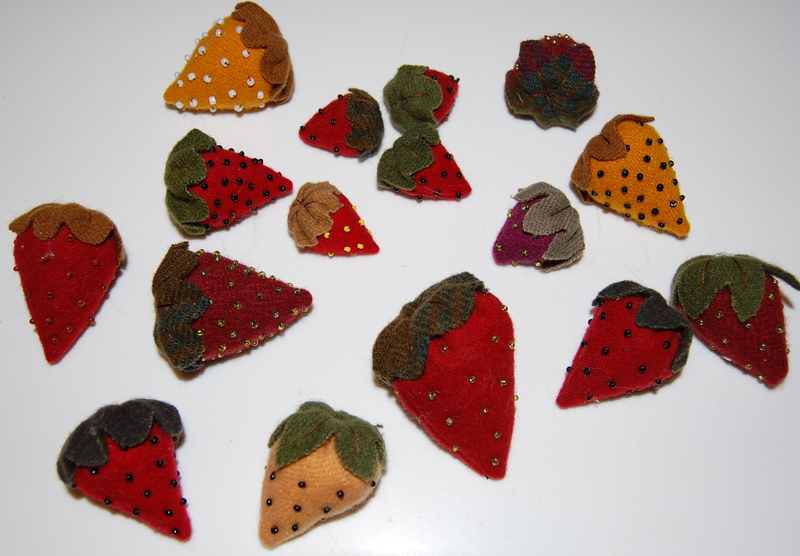 I have been making those strawberry pincushions since the instructions were published. As a matter of fact I think I made one for Susanna as a gift. Your strawberries are wonderful. Thank you! I’ll have to ask Susanna about hers. Aren’t they fun to make?